Take a look at this iRing design concept by Victor Soto used to control any Apple media device including iPods and the iPhone. The ring charges in its own custom-sized cradle and has a small OLED display inside the small Apple logo that indicates it’s current status of play or pause, which can then be toggled by touch. Sliding a finger across the ring one way or the other will adjust the volume and the ring can be locked by squeezing your finger to avoid inadvertent touches. 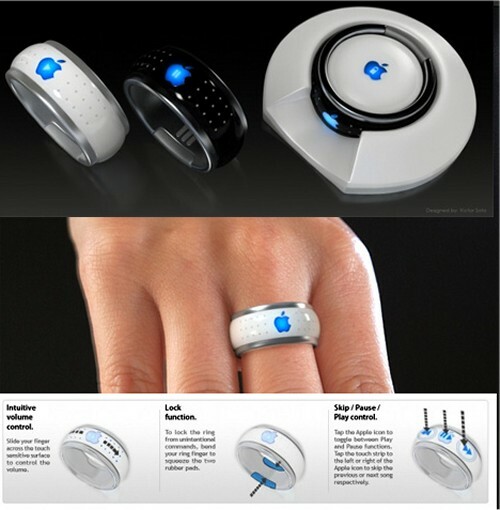 The ring can be used play, pause, move tracks back and forward and control the volume of an iPod or iPhone wirelessly, and will instantly identify you beyond the shadow of a doubt as a tried and true Apple fanboy. I would totally get that. I am an Apple fanboy though so I guess that’s why I would get it. You have to admit that it looks really nice and is a great idea especially for people who lose things all the time. I don’t usually sign on with apple products…I’m a linux boy, so I turn my nose up to the major OS’s…but this is just a fantastic idea, and I would SO get one of these. Please please please god, some one make this!!!! it will replace my wedding ring! even if it doesn’t do all the cool control things it still looks spanking! This is awesome!!! i would definitely buy one of these! It would make it alot easier for me to manipulate my iPod. and in my desk bind them! when does the iring come out? how mutch will it cost? where is this iRing at cuz i can’t find one gosh!??!?! what if you fall asleep with it on and then forget about it, then you take a shower the next day and it ends up getting wet??????????? Will this ever be available to purchase??? Why doesn’t anyone have the answers to if this will be released to buy or not. Can not read the information being black letters over grey ! It should also serve as a security device. 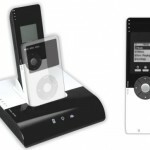 The iPhone, iPad, iMac or iPod will only unlock with a password or when the iRing is within range. Great idea. I would buy it even without my suggested improvement. How mush is the iRing selling ?? and where can i buy?? TAKE MY MONEY RIGHT NOW! I think this would be the great idea. I also agree with Brian Woodbury about the security system. it would help me get work a lot faster in school instead of unlocking my phone going to song app then finding a song. is it already available here in the Philippines?